Worms are important for a fertile soil however, in autumn and spring, cast forming worms are really active just below the lawn and this can be a nuisance. The muddy worm casts they create can ruin mower blades and often encourage lawns to become weed infested. Ignoring the casts and squashing them flat creates an uneven surface and smothers the grass. 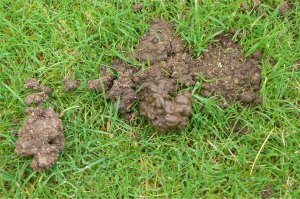 Rather than killing the worms, which solves one problem but creates far more = poor drainage and poor soil aeration, which causes poor grass growth. You can help reduce the problem by persuading the worms to move away from the lawn and into nearby borders by applying a sulphur-based spray. The worms don't like acidic conditions and will go somewhere more comfortable leaving the lawn cast free. Apply as recommended on the container.